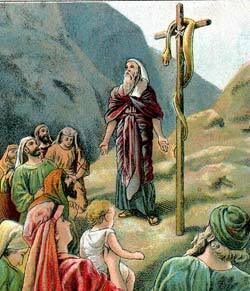 Moses sets up the brass serpent on the pole. THE PEOPLE WEREat first very sorry for having so displeased God. But they soon forgot it all; and the next time that they were without water in their encampment, they murmured, as usual, against Moses and Aaron. Then God commanded Moses to take the rod with which he had struck the rock in Horeb, and before all the people to speak to a certain rock, which He pointed out, and it should give water for them and their cattle. But now both Moses, and Aaron, who was to go with him, did wrong. They thought that speaking to the rock, as God had said, would not be sufficient; so Moses struck it twice with his rod, angrily asking the multitude whether he and Aaron must fetch them water out of the rock. And though, notwithstanding their disobedience, the water, when the rock was struck, flowed out in such abundance that all had enough, God told moses and Aaron that because they had not obeyed Him when He bade them speak to it only, they should neither of them enter into the promised land. Aaron, whom God had appointed chief priest, died very soon afterward, on Mount Hor, and Eleazar, his son, was chosen by God as priest in his place. The land of Edom, which God had given to Esau, now lay between the Israelites and the way by which they were to go to Canaan. So Moses sent messengers to the King of Edom, asking leave to pass through. But the king not only refused to let them pass through, but threatened to lead out his army against the Israelites; so they were obliged to turn aside, and go round Edom. There they met with so many difficulties that they got quite dispirited, and , as before, murmured against God. Then God, to punish them, sent among them fiery serpents, which stung great numbers of the people, so that they died. The fear of death made the Israelites repent, and confess their sin in speaking against God. So they asked Moses to pray for them, that God would take away those dreadful serpents. And when Moses prayed, God told him to make an image in brass in the likeness of one of the serpents, and to set it up on a pole, and He promised that every one who was stung should be cured when he looked up to it. Moses did as he was commanded. And every one who looked upon the brazen serpent was healed.